Hateful flyers appear in Brightwood and north; donate a dollar for every flyer? I debated publicizing this when I first heard about it a few days ago, as I don’t want to give the lowlife who’s posting the hateful flyers attention, because that’s what this idiot wants (that, and to scare people). Flyers sharing racist and xenophobic messages have appeared on car windshields near the Safeway on Piney Branch, along 6th and Whittier, 5th-7th Streets and Fern, etc. The flyers include a logo for milice française, apparently in an attempt to create fear and suggest violence. Neighbors are taking them down as soon as they see them. However, it’s important for neighbors to know it’s happening, and know whom to call when you see the flyers. And it's important for all our neighbors to know this negative, racist and xenophobic message is not the voice of the community. Let's be clear, this is a lone voice, a misanthrope and someone who needs help. If you see one of these idiotic, ignorant flyers, you can remove it and call 911 to report it. You can also call the Hate Crimes Hotline at 202-727-0500 (you can report incidents anonymously). If you leave a contact number, someone will return the call the next business day. See also the Office of Human Rights website for more information on reporting hate crimes. Here’s a great idea someone made on a local Facebook page, DC Collective Action Network… we should set up a donation so that a dollar gets sent to immigration assistance non-profit Ayuda every time a flyer is found. Anyone interested in taking this project on? 8/27 Update: A group of neighbors have already raised money to donate to Ayuda. "On Friday, I pledged to donate $1 to Ayuda and Casa for every anti-immigrant leaflet collected in Ward 4. In twelve hours, I got reports of 130 leaflets and 5 people pledged to join me. I hope the turdblossoms that distributed these leaflets will be happy to know that they are responsible for $780 in support for organizations that provide services to immigrants." 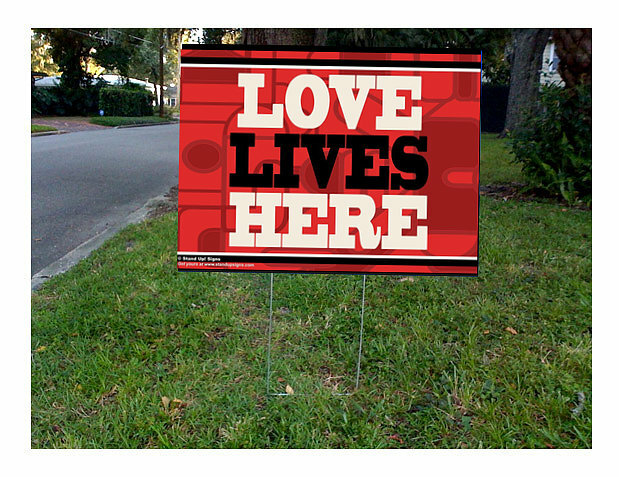 If you want to put up a Glad You're Our Neighbor yard sign, you can get them from my company Stand Up Signs. 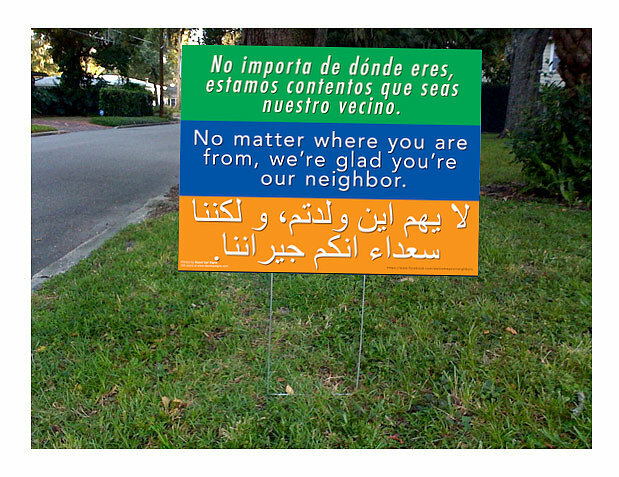 We donate 10% of proceeds to human rights organizations, with Ayuda receiving the donation for this particular sign. Show that your voice of acceptance is louder than their voice of hate.